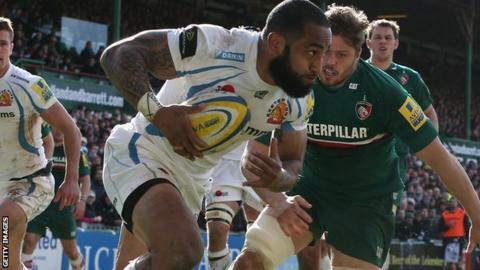 Exeter's Tongan international winger Fetu'u Vainikolo says he is excited at the prospect of playing for Tonga at the Chiefs' Sandy Park home. There are less than 500 days to go until the tournament begins. "If I get picked for Tonga it'll be an honour to play and put the red jersey back on, especially back here on my home ground at Exeter," he said. Exeter was named as one of the last year. As well as the Tonga match at Sandy Park on 29 September, Georgia will play the African qualifiers on 7 October before Italy take on Romania four days later. "Fingers crossed I get in the squad somehow," the former Connacht and Highlanders winger, who told BBC Sport. "Obviously Tonga's always on my mind, but I've got a job to do here at Exeter Chiefs. "It's a blessing to be honest. It's emotional - it's a feeling that you can't explain as a rugby player when you represent your country."